Deluxe Tsoureki DELUXE LINE… and it smells like Easter! Bread Sticks are now found in every home! Indulging salty snacks with the company at home, at the office & at school! Butter Bretagne 82% BEURALIA 150 g.
Frangipane Mix DAWN 500 g.
Prepare noisette butter and allow to cool. Mix the Frangipane together with the eggs and the water and finally add the noisette butter. Spread the mix on two baking sheets, 45*8 cm. Bake at 170°C for 18 minutes. Premium Baker’s Select Crème Cake Base Chocolate DAWN 500 g.
Mix all the ingredients together in the mixer for 5 – 6 minutes at the 3rd speed. Spread the mix on a baking sheet 45*8 cm., previously covered with a baking paper. Bake at 190°C for 10 minutes. Hot Cream KOMPLET 20 g.
Prepapre the basic creme patisserie. Almond-flavoured Creme Patisserie (prepared, as above-mentioned) 300 g.
Fond Royale BAKELS 36 g.
Whipping Cream Excellence 35,1% ELLE & VIRE (whipped) 400 g.
Warm the syrup to 35°C and mix with the Fond. Pour this mixture in the Creme Patisserie and stir. Finally, incorporate the whipped cream. Delicream San Felipe DAWN 1.000 g.
Decorgel Neutral DAWN 1.000 g.
Warm separetly the Delicream and the Decorgel. Then, mix the two ingredients. Spread 450 g.of Amarena FABBRI on each Chocolate Sponge Roll. Divide in two pieces, cover with paper and put in the freezer. 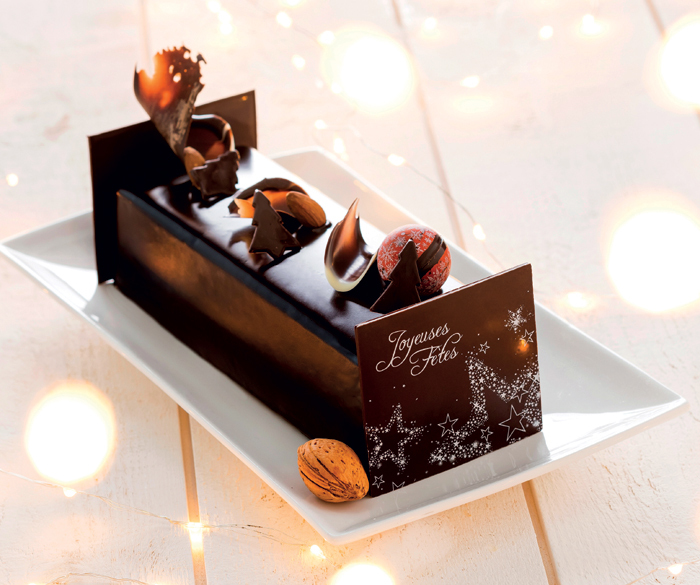 In a rectangular log mould, spread one layer of Almond-flavoured Mousse. Then, place in the middle the frozen piece of Chocolate Sponge Roll. Finally, close with one layer of Frangipane Sponge. Put the log in the freezer. After freezing, take the log out of the mould and cover with the chocolate icing.